NACTO recommends creating a hierarchy of uses for different street contexts, which can inform decisions about how to allocate the curb. For commercial areas where customer access and foot traffic are paramount, modes of travel that move more people in less space should be prioritized. Two metered parking spaces might top out at 30 cars turning over per day, for instance, while a bike-share station that replaces them could be used by 40 people per day. A dedicated bus lane might speed service and improve access to a commercial corridor for thousands of people. Even if the bus lane isn’t by the curb, cities need to rethink curb space to ensure the bus lanes work well. 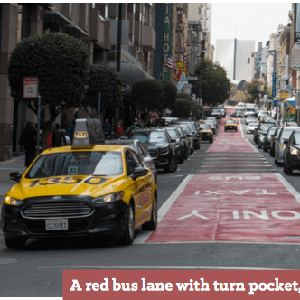 A turn pocket, for instance, can prevent drivers from blocking a bus lane at the approach to an intersection, like this example in San Francisco (see photo). Prioritizing spatially efficient transit can help commercial areas thrive. But business owners often prize access for customers who come by car. NACTO recommends conducting “arrival mode surveys” to demonstrate the importance of access by other means. In Los Angeles, for instance, business owners on Cesar Chavez Street guessed that 36 per cent of their patrons arrived by car and none arrived by transit, NACTO reports. However, a city survey of shoppers on the street found that nearly half arrived by transit and only 7 per cent drove. To free up the curb, it can’t be reserved for people to drive up and park right next to their destinations. Metered parking can be shifted to side streets, and so can deliveries. Loading zones don’t have to be directly in front of storefronts. In New York City, the DOT surveyed merchants along one bus corridor and found many would prefer loading zones farther away from the store in exchange for longer time limits. For commercial streets that retain metered parking, dynamic pricing is the key to maximizing the public benefit. Setting parking meter prices to respond to demand can cut congestion and improve transit service on the corridor by reducing the time drivers spend cruising for open spots. There is no magic formula, but thoughtfully managing curb space to prioritize local needs and conditions, not private car access, will help more people get around crowded cities while improving access to commercial areas.